Indulge with these Pizza Stuffed Mushrooms at your next party. They have all the flavors of a mushroom and spinach pizza minus the carbs…so go ahead enjoy! Pizza night comes around once a week at our house…on Friday. It signals the end of the week and everyone looks forward to it. At this point: Pizza = Fun. It’s amazing how food associations can be so easily cemented. I love pizza too. But, I could do without all the carbs at the end of the day. There are plenty of ways to make healthier versions of pizza, but this is by far my favorite. Serve it as an appetizer and I guarantee that you will eat a lot less traditional pizza. Follow these tips for the perfect pizza on a shroom. Brush dirt off the mushrooms with a damp towel or scrub brush. For best results, do not put them under running water. Mushrooms absorb water very easily. Pop out the stem and scoop out the membranes in the middle. 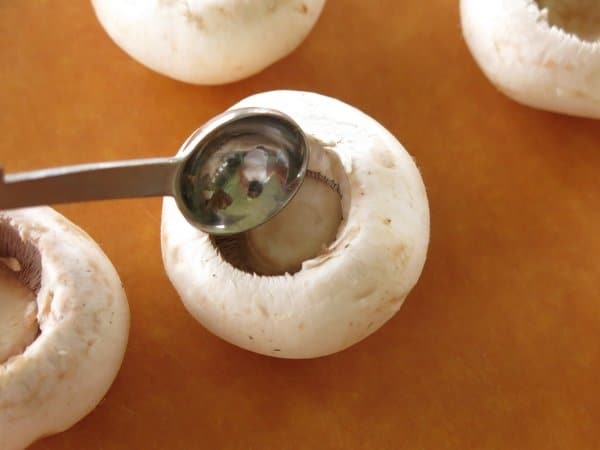 A small measuring spoon is a perfect size for small mushrooms. Use a pastry brush to lightly coat the outsides of the mushrooms with olive oil. Bake in a 400 degree Fahrenheit oven for about 10 minutes. The mushrooms should be tender, but still firm. 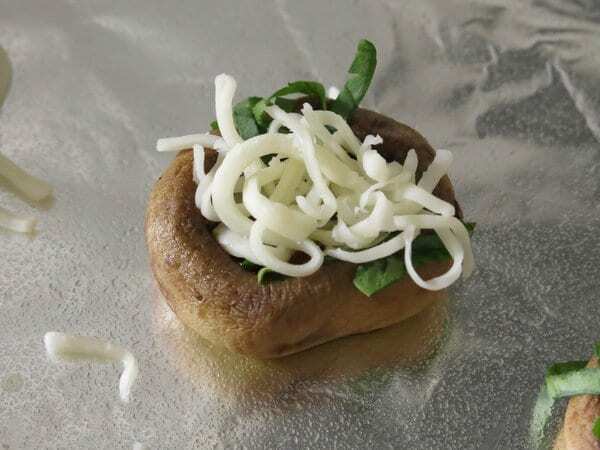 Pour the juices that pools in the center of each mushroom out before filling it with pizza sauce and toppings. Add your favorite sauce to the center of the mushroom. The amount will vary depending upon the size of the mushroom and how much you like sauce. Prep your toppings. My new obsession is chiffonading spinach. 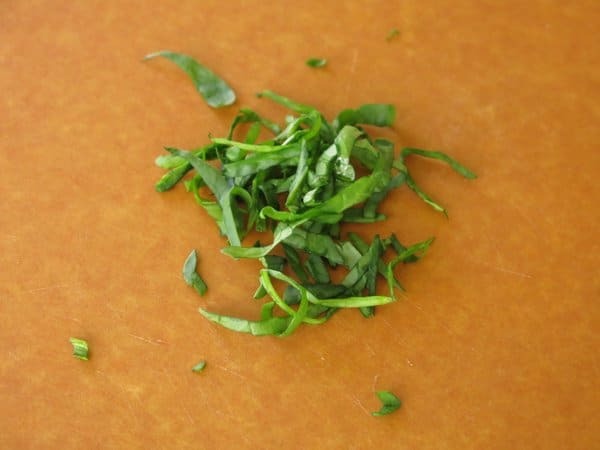 Stack 4 or 5 spinach leaves, roll them and then use cooking shears (or a knife) to cut the stack into thin strips. Place spinach strips on top of the sauce and sprinkle with shredded cheese. 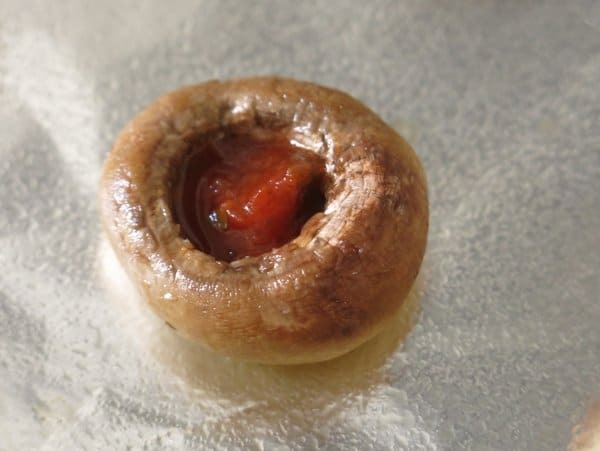 Other topping ideas for mushroom pizza bites: tomato (diced or a slice from a cherry-sized one) onion, peppers, sliced or diced pepperoni, ham, pineapple…just about any topping works. 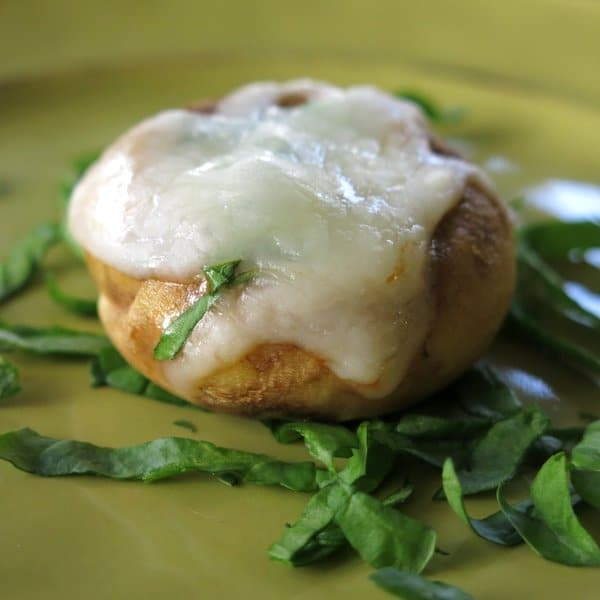 Mushroom Pizza Bites have all the flavors of a mushroom and spinach pizza minus the carbs...so go ahead enjoy! Brush dirt from mushrooms with a damp cloth or brush. Brush outsides of mushrooms with olive oil using a pastry brush. Bake for 10 minutes. Mushrooms should be tender, but still firm. Remove mushrooms from oven and change setting to broil. Stack about 5 spinach leaves, roll them and then cut into thin strips. Repeat with remaining spinach leaves. Top sauce with spinach leaves and then mozzarella cheese. 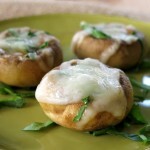 Return mushrooms to oven and broil for about 2 minutes or until cheese is melted. Use tomato-based sauce with no added sugar and low-fat cheese to keep recipe South Beach Phase 1 compliant. I can see mushroom pizza fans running over to the table to grab a bunch of these off that tray. Looks great. Oh, wow! 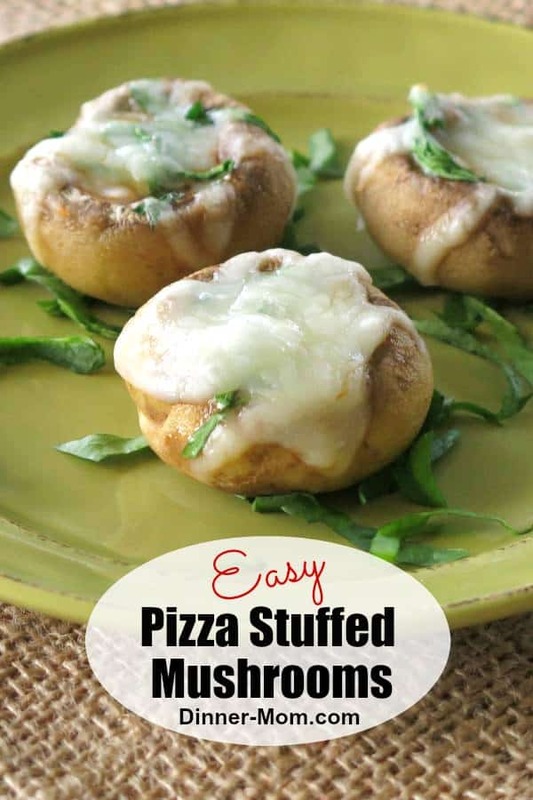 What a yummy twist on stuffed mushrooms. I could never resist that melty cheese! YUM! oh my goodness, I love this idea! I only recently started making mini “pizza” bites with vegetables and love it! can’t wait to try this! love!! Adore this, and all of your variation suggestions! I have been craving mushrooms so these are making me soooooo hungry!! They sound fabulous! These sound wonderful. I don’t eat bread and this is a good substitute for the pizza craving. I love stuffed mushrooms! A little mushroom pizza in every bite! You can never have too much mushroom in my book! 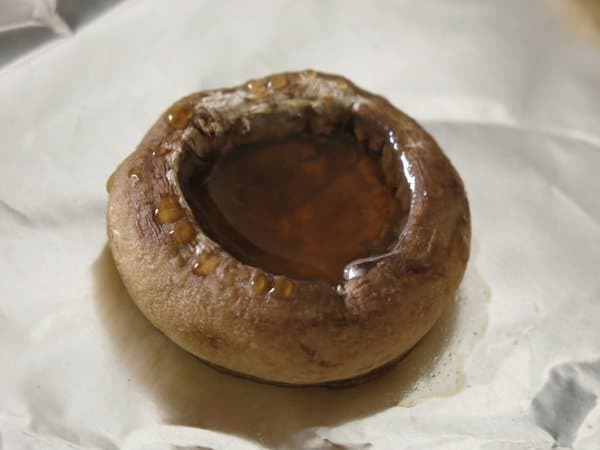 I LOVE mushrooms when they’re baked… and stuffed pizza style? Heck yes! Pizza bites were some of my favorite snacks growing up. LOVE this cheesy spin on it–have a fantastic week! Cheese + Spinach + Mushrooms = Happiness =) And as you stated, Marjorie, no worries about the calories…You have created a tantalizing +++ tray! I’m not a huge mushroom fan, but this recipe makes me want to give them another shot. Thanks for sharing. I hope it’s the recipe that turns you into a mushroom lover! Thanks for stopping by and commenting! How many carbs…looks so good. 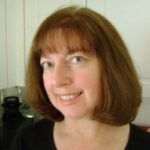 I don’t understand why I’m being asked to disable my pop up blocker just to post this on Pinterest. I’m so sorry you had difficulty. I believe that the pop-up might have to do with the images that pop-up for you to pin. You can also directly repin from Pinterest. These were so easy to make and my hubs loved them. We added some chopped pepporini and they were delicious.